What would have happened if Ford hadn't come to the party? Would Keith Duckworth and Mike Costin have built a Formula One engine on their own? It's not likely. All they'd done up to the end of 1965 was design and build some engines for secondary racing formulas based on production blocks. These were not obvious credentials for the builders of a V-8 that turned out to be the most successful engine in Grand Prix history. The Cosworth team were talent-spotted by Colin Chapman and backed by Ford of Britain thanks to the intervention of Walter Hayes, who died on December 26th at the age of 76. Hayes had just turned 30 at the beginning of the Sixties, when he formed the link with Chapman that led to the Ford DFV engine. The son of a printer, the Shepperton resident had risen through journalism to become the precocious editor of the Sunday Dispatch. Looking for a motoring column that would be "somewhat different," he thought of asking Chapman to become a contributor. When Hayes moved to Ford of Britain to take charge of public relations in 1962, the Lotus chief naturally came to him to seek help with a twin-cam engine project. Chapman got more than help; he was asked by Ford through Hayes to create and produce the Lotus Cortina, which became a huge image-enhancer for the worthy but dull British Ford range. This became a strong UK contribution to the 1960s "Total Performance" thrust of Ford worldwide. The special Cortinas were produced from 1963 through May 1966. Meanwhile, Colin Chapman learned that Coventry Climax wouldn't be making engines for the new 3-liter Formula One that was starting in 1966. Climax's powerful and successful partnership with Lotus was broken. Where to turn? "I asked Keith Duckworth if he could produce a Grand Prix engine," Chapman told Doug Nye, "and he thought he could, so I offered to find the money to finance it. He said he would need £100,000 and I shopped around in several places." On his first approach to Ford, Chapman was given the brush-off. Of his other contacts David Brown, Aston Martin's owner, was the most promising. Then, with the help of Hayes, Chapman dined with Harley Copp. A genial American engineer, Copp had backed Ford's performance efforts in NASCAR and other series in the Fifties. He was susceptible to Chapman's arguments. Together, Copp and Hayes developed a plan to back Cosworth and presented it to the Ford UK board, newly headed by Stanley Gillen. The board approved the initiative, which was made public at the end of 1965. Ford regarded its £100,000 - no small potatoes in those days - as a down payment on a two-stage project that would first produce a four-cylinder twin-cam engine for Formula Two and then, by May 1967, a V-8 Formula One unit. As we know, the V-8 won its first race - the Dutch Grand Prix on June 4th, 1967. The driver was Jim Clark. 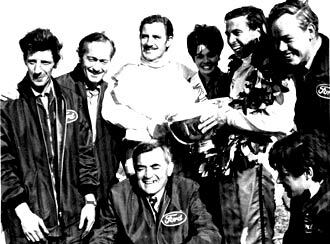 The presence of Graham Hill in the team was at the specific request of Ford and Hayes, who wanted to be sure that a strong driving cadre would be seated ahead of their engines. "At the time," Hayes told John Blunsden, "it was a fair old gesture of confidence on my part. I hadn't been with the company all that amount of time, and I sort of hung my career on the line with that engine. In fact, I stuck my neck out a million miles. I must say, though, that frankly it never occurred to me that Keith's engine would be anything other than a tremendous success. He'd had such a good record all along, and we knew where he'd been." Hayes stuck his neck out far enough to tell Henry Ford II that he thought the engine was "fairly likely" to win a World Championship. In the event it won a baker's dozen. The relationship between Hayes and H.F. II was pivotal to the former's successful Ford career. Short and bespectacled, pipe-smoker Hayes had a quietly knowledgeable, even conspiratorial way about him. He made himself useful to the younger Henry Ford, who became a tacit supporter of Hayes's initiatives. Walter in turn became one of the biographers of 'Hank the Deuce'. One of Henry's major projects was the establishment of Ford of Europe, to which Hayes moved soon after its founding in 1967. At the end of the Seventies, Hayes came under the wing of new Ford chairman Philip Caldwell and moved to Detroit to head public affairs for the Corporation. He launched new motorsports initiatives there, including the IMSA GTP projects. When Caldwell retired, Hayes returned to Britain as vice chairman of Ford of Europe, an indication of the clout that he still possessed in Ford. A colleague of his described Hayes as "a terrorist. He sets bombs all over the Ford Motor Company and threatens to detonate them." Although his style of operation was anything but conventional by Ford standards, it was exactly his intuitive guerilla approach to problems and opportunities that made Hayes so effective - especially in motorsports, where Ford had few fixed rules. The Hayes Touch often moved Ford's racing efforts forward. Until the DFV engine had established itself as a commercial proposition, Ford loaned the units to selected teams. When Ken Tyrrell needed £20,000 for Jackie Stewart's salary to drive for his team in 1970, Hayes guaranteed it. From this grew a life-long relationship between Ford and Stewart that was of great benefit to both parties, culminating in the Ford backing and later purchase of the late Nineties Stewart Grand Prix team. Ford of Britain and Hayes provided important logistical support to JW Engineering, the company that built the GT40s. Walter's close relationship with Henry Ford II was instrumental in Ford's purchase of AC Cars, which didn't work out, and Aston Martin Lagonda, which did. Then Ford and his third wife were spending much of their time at their home in England. Having retired from Ford in 1989, Hayes was put back in harness to head up Aston. During his five years in charge the company launched its successful DB7 model with the help of a former Jaguar sportscar project and Tom Walkinshaw's TWR Group. The Hayes flair for publicity was a great help to Aston Martin as it sought to re-establish itself. Since his retirement from Aston Martin in 1994, Walter Hayes has been active on the lecture circuit on behalf of the Aston Club's Trust and the Brooklands Trust, both of which he was instrumental in founding and supporting. With Ford, which sponsored its first exhibition, he was a key backer of the V&A's Boilerhouse exhibitions and the later Design Museum on London's South Bank. Walter Hayes seemed - and indeed was - a man incapable of slowing down, until illness applied the brakes. His loss will leave a giant gap in Britain's motoring and motorsports infrastructure.